I have many beautiful notebooks. Nothing is more satisfying than putting pen to paper of some kind. Although I use the keyboard often I retain my books. And I like nice books which I use alongside exercise books, writing pads, scraps of paper, envelopes and everything in between. Of the two above, one I bought myself. As a coffee lover I couldn’t resist the cover but it has the added benefit of an elastic band to secure it closed. Useful for odds scraps of paper or pictures I pop inside to use at a later date. The second book was a gift from a dear friend. Another writer, and one who values the pleasure of writing on nice paper in a beautiful bound book. It has a bookmark which is most useful. The image on the front prompts memories of my life in Thailand. When my my wanders, incidents from my time in the different culture carousel in my head, sometimes sparking an idea for a story, and always the paper is to hand for me to jot notes. Last Monday I attended a meeting for community education tutors and arrived early. With a cup of coffee and a comfortable seat at a table, I opened the gifted book and flipped through it. On a blank page, I wrote the word Taxi – to use as a free writing prompt – and proceeded to write. After four lines a story emerged. Remarkable how an idea leaps into the head and onto the page, and I wonder what ideas my synapses connected to produce it. The theme is a memory from the future. Yeah! My thoughts exactly. But I have the characters, the outline, and I know where it is going. I only have to write it. Do you remember your schooldays when at the start of a term new exercise books landed on the desk. Remember opening one? Smelling the newness, seeing the pale lines on white, touching the virgin page. I still enjoy the sensation when I open a new notebook. Leaving the first page blank or writing my name with extreme care so Quink ink blots wouldn’t spoil it. 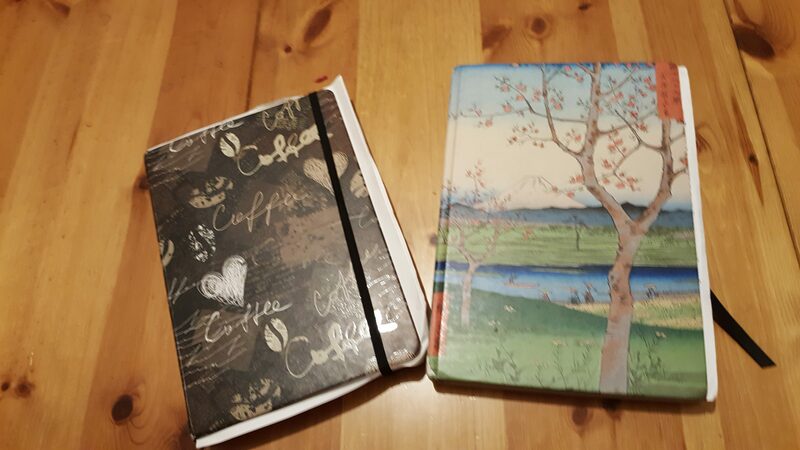 I’m hoping my friend Margaret McKenna, artist, writer and creator of Celtic Myth Cards https://www.celticmyths.ie/ will offer a beautiful bound notebook along with the cards, calendars, and mugs. Treat yourself to a quality, hard backed beautiful notebook and see what happens. In the meantime let your writing flow and have fun.